I have never been more perplexed! Just a little more than normal this week. 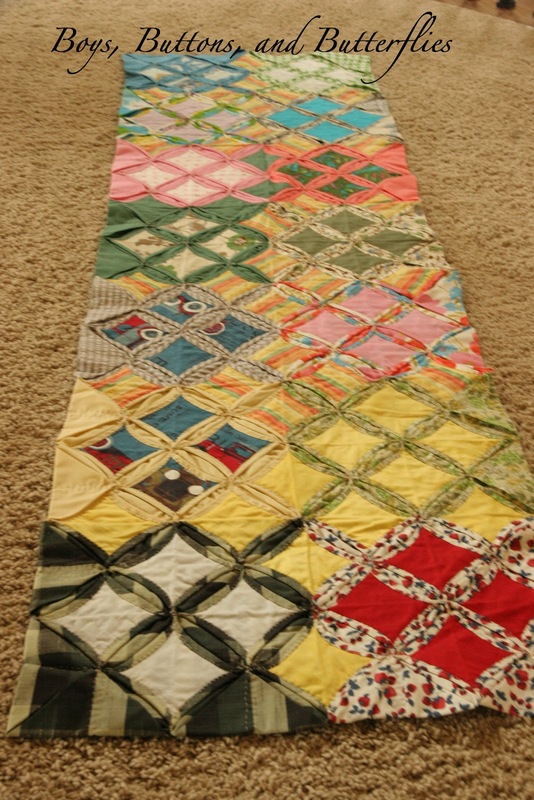 If you are a regular follower, you might remember my latest quilt....Baby William's quilt. When my friend commissioned me to make his quilt, I pretended to ignore her about the cost. I had a number in mind when I started it, but it gradually dropped to nothing as I worked on it. Forgiveness? Yes, forgiveness for not finishing other fairly simple items that she had asked me to make over a year ago. But true big-hearted, kind, self-less, Julie style...she surprised me. She showed off William's quilt to my scrapping friends at our scrapbook retreat. I blushed and stammered. I don't take compliments very well. I am worried that it isn't good enough. I am embarrassed and think no one will like it as much as I do. Then, I pretend to be busy. A tap on my shoulder and then these are laid on my lap. 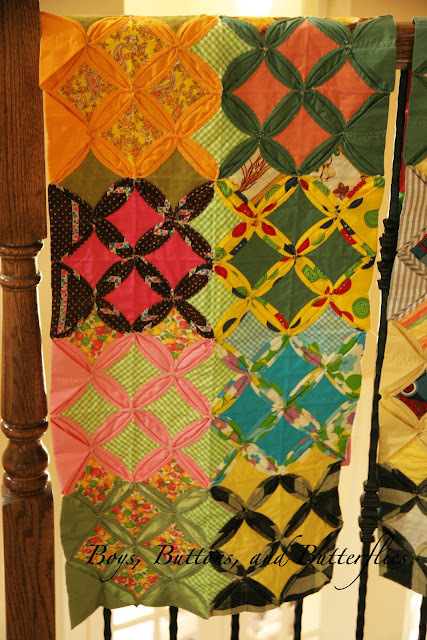 I thought..WOW, she found some vintage quilts to give me on one of her various trips or travels. "I'd like to see them hanging on your ladder in your Studio"
My response was "NOOO, Julie. I can't take these. These are beautiful." "They are handmade cathedral window quilt done by your Mee-mah." She would not take them back, of course. She walked away. I kept them on my scrapbook chair the whole weekend. They burned on my back. They glared at me every time I returned from naps, meals, and church to my seat. They shook their heads. You know Julie....there isn't much to do about it. So, my blogging friends and followers...any ideas of how I can get these back in her hands without offending? The only thing I can think of is to make a gift for her daughter...but there is no big wedding or event in the near future. Also, they are not exactly lap quilts with their odd shapes. So, again, I am always perplexed. Oh...and if you see an anonymous comment that tells me to keep them....that is HER! This is a hard one. Are you able to do like Cindyc said? 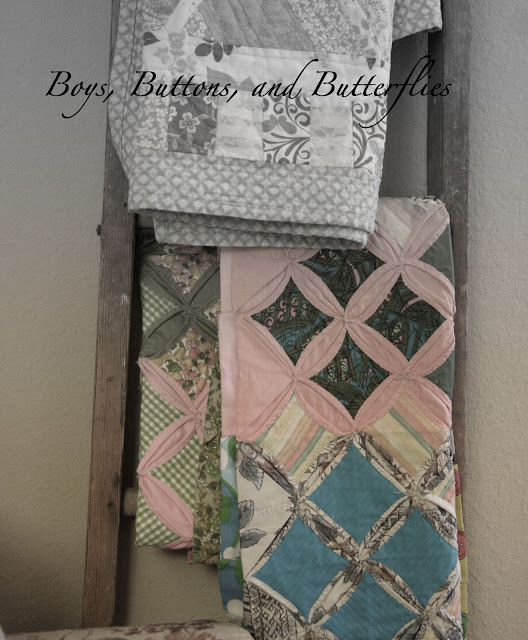 Maybe a mini quilt for your wall and then some cushions. Maybe make three lap sized quilts by framing those beautiful cathedral windows? One for you, one for your friend and one for her daughter. They are so pretty!! I understand you and the way you feel, but there sure is a reason why your friend wanted you to have them. She gave them to someone who would truly appreciate them. I like Cindy´s idea if you still want to do something for your friend or her daughter. they are beautiful and you KNOW i don't quilt, so I have no good input. However, I am sure you will come up with something. A wall hanging? 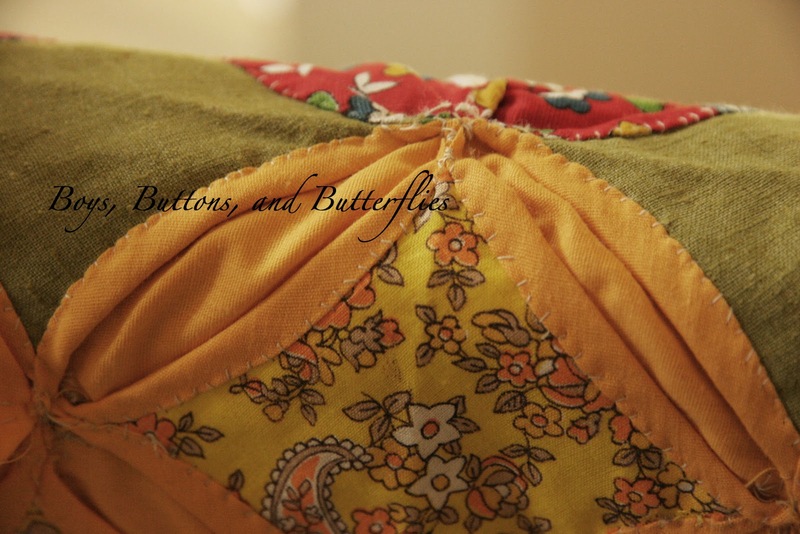 A mini quilt ? A few pillows? Please don't take them apart! If I gave someone a handmade quilt and she took them apart to make something, I would be so upset. If I were you, I would keep them. I've given away every quilt I've ever made. I made two for my cousin's kids when they were born, and I made one for my aunt (the mother of that cousin) when she was fighting breast cancer. 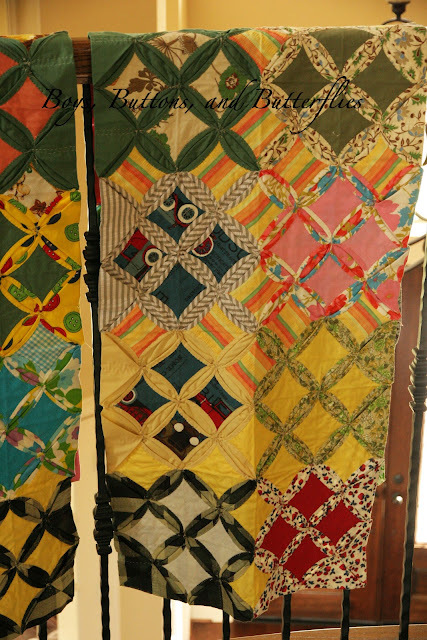 Recently I visited, and she presented me with a gorgeous handmade quilt that she said was on her bed when she was growing up. I didn't want to accept it, but she said I was always making quilts for others and I was the only one who would really appreciate it. So, I kept it. It's one of my most prized possessions. One idea, if you want to say thank you with a quilt, then you can still make her daughter a quilt even without a "special" occasion behind it. You can say it's to be put away for her birthday or make an I-Spy style quilt and give it to her as they set out for a family vacation this spring or summer. Just please don't destroy the quilts she gave you. I understand that it would be a hard thing to keep them but agree that she gave them to you for a reason. She knows that you would appreciate them. They are beautiful, by the way. I would hold onto them and if the occasion comes to gift one to her daughter, like a wedding or something then do so. 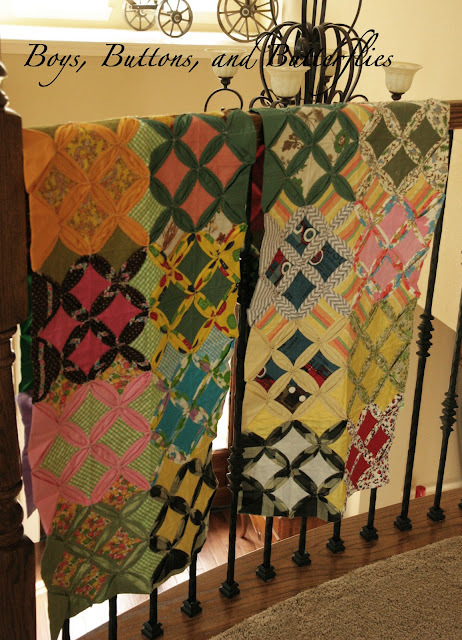 I wouldn't take them apart but maybe you could make another quilt and sew them together? I'm not sure if that makes sense but I'm trying to think of a way to make it a useable size without taking it apart. Hi all! I just CANNOT cut these up...so I think for now, I am going to just cherish them. They are so precious, I wouldn't even dare alter them. The only thing I might consider is that I might piece them together somehow! I don't know Heidi. I think I would personally seperate each block and try to keep them close to the orgional set up. But I would put a 2 inch x wof of block in a cream sashing inbetween each block. At the intersections place a 2 inch square in any of the coordinating colors. Multicolored squares and prints would work out great. Along with a multicolor binding and a cream border. I would then find a way to gift it back. 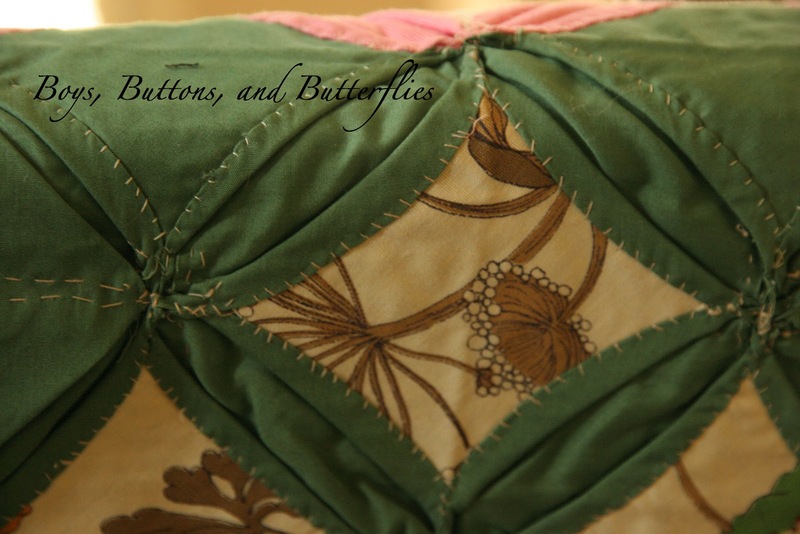 Maybe seeing the quilt all done up your friend might make her fall in love with it all over again. Oh, it does not have to be squared bloks these window blocks would look great done in a lattis too! Heidi you silly woman...you do not give back gifts. Hang them on your ladder and each time you look at them think about the love that just keeps getting spread around. Your friend most certainly though hard about something to give you that would mean as much to you as it would to her. Wait for the daughter to get married and then applique them whole onto a white quilt top.